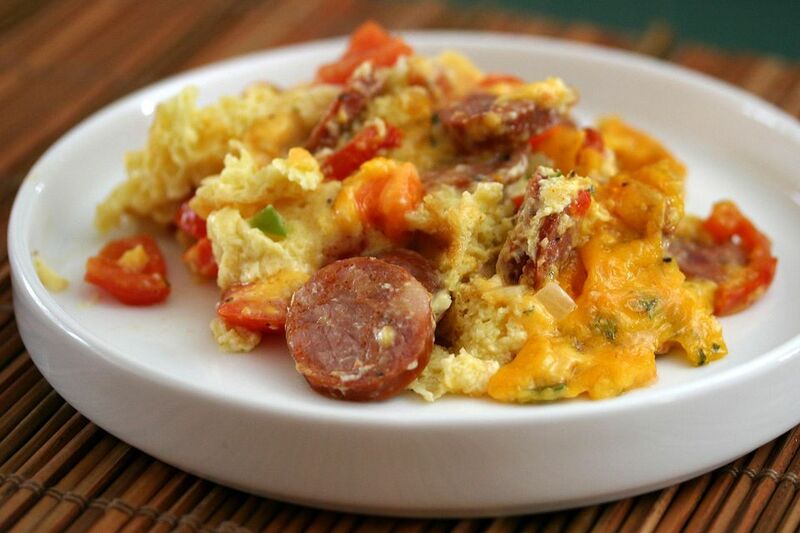 Spicy andouille sausage and Creole seasoning jazz up this flavorful breakfast casserole. Serve this casserole with fruit for a great morning meal. For milder flavors, use breakfast sausage or another smoked sausage, along with seasoned salt instead of Creole or Cajun seasonings. Heat oven to 350 F (180 degrees C/Gas 4). Butter a shallow 2-quart baking dish. In a large skillet, cook sliced sausage with the onion and bell pepper until vegetables are translucent. Whisk eggs with milk in a bowl with the Creole seasoning, pepper, and parsley, if using; set aside. Arrange the torn bread pieces over the bottom of the buttered baking dish. Sprinkle with the sausage mixture and the diced tomatoes. Top with Cheddar cheese, then pour the egg mixture evenly over the top. Sprinkle with salt and pepper. Bake the casserole for 35 to 40 minutes, or until it is puffy and lightly browned.